As the country observes National Child Passenger Safety Week this week, embedded within Baby Safety Month, Safe Kids Worldwide has released an alarming study in a report called “Buckle Up: Booster Seats,” which was funded in part by a $2 million grant from the General Motors Foundation. The report states than nine out of 10 parents remove their children from car booster seats before they reach the appropriate height of 57 inches (4’9”). 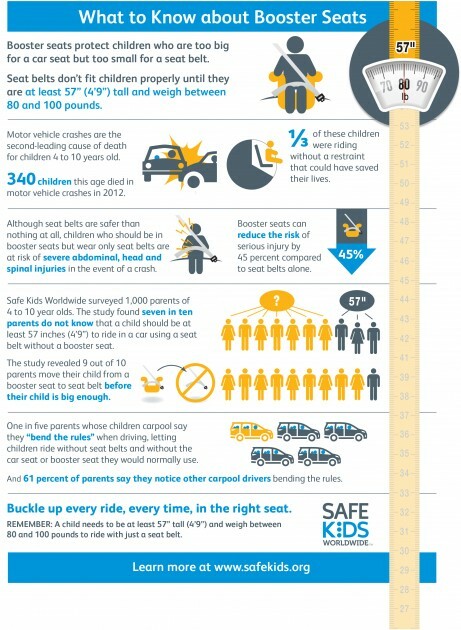 The Buckle Up: Booster Seats findings were based on a survey of 1,000 parents with children between ages 4 and 10.